Uniquely Elegant. This beautifully crafted Diamond and Sapphire Ring features a glorious 6x4mm center oval prong set sapphire with 2 side sapphire stones along with sparkling channel set diamonds. Crafted in solid 14K White Gold measuring 6mm in Head & 3mm in band width, the design lends to a modern yet classically elegant look. This piece is sure to impress. 6 round diamonds weigh 0.12 ct.tw. H-I Color, SI Clarity Approximate Measurements: 5x3mm head, 3mm band width. 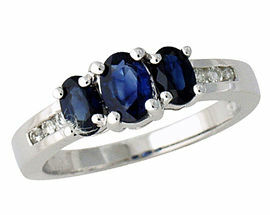 We guarantee our 14K White Gold Sapphire and Diamond Channel Ring to be high quality, authentic jewelry, as described above.